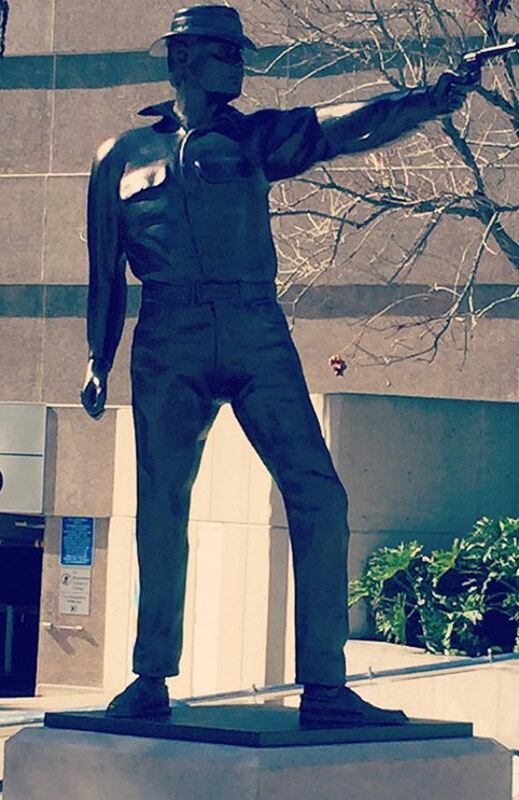 I can't seem to find anyone or any outlets comment on this, but the statue outside Dougie's office building appears to be of David Bowie, circa 1976. And it comes 'twixt the appearance of his co-star of that period (Candy Clarke, The Man Who Fell To Earth) and a scene set in Phillip country, Buenos Aires. I'm pretty sure it was him. Anyone grab a still featuring the statue? Well spotted Haldeman. This statue looks almost EXACTLY like Bowie in the Man Who Fell to Earth. That would be pretty cool and I totally see it, but here's another POV of the statue which hardly resembles David Bowie at all. I wonder what Coop's fascination with the statue is. Cant help but notice he keeps touching the shoes (which he lost in transit) when he came back into the real world. Thoughts?? 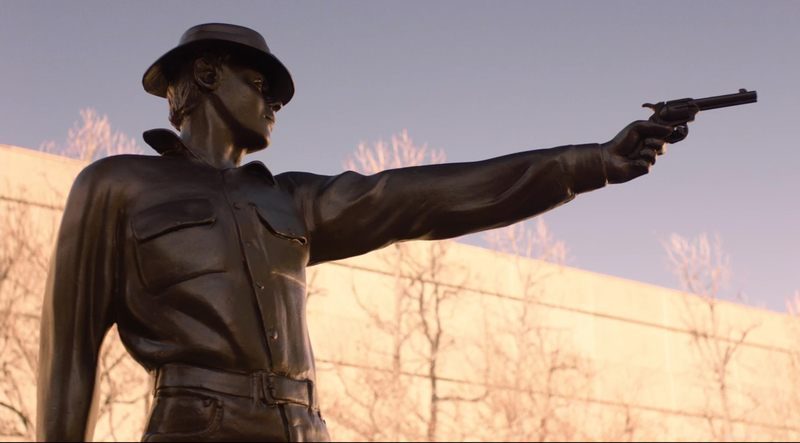 I think the idea of "Case Files" and the statue of the man with a gun are reminding him of his past with the FBI. That, with the coffee - Something with Jog his memory! But what? 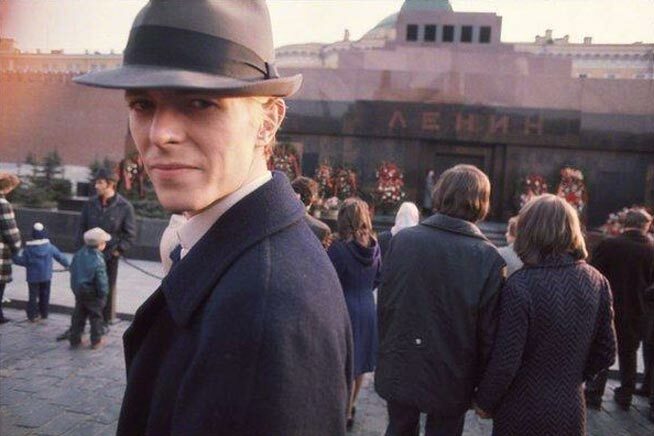 Someone posted this on Reddit, comparing early 80's Bowie with the statue. 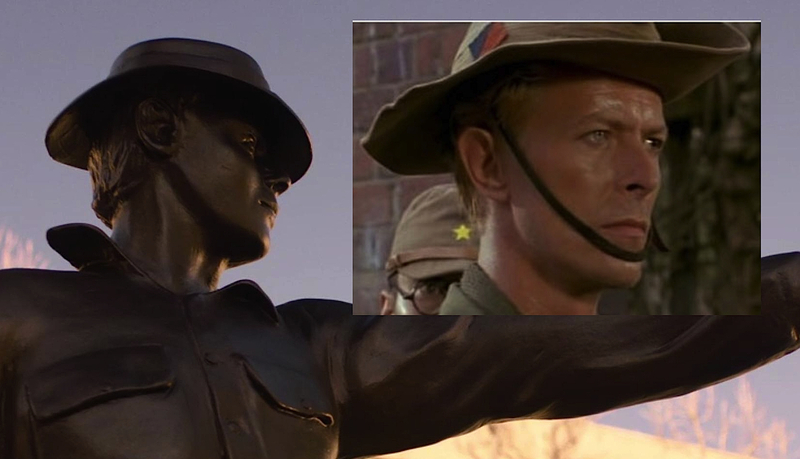 There's something 'odd' about the statue - it reminded me of David Bowie/ Phillip Jeffries. Someone with a gun should probably look like a soldier - but that doesn't... the pose is all wrong. I keep thinking that there might be something going on like in Kurt Vonnegut's 'Sirens of Titan' where individuals pass through like comets. I just saw this as it tweaking a connection with Cooper's real past as fighting on the side of the law... the shoes are black (the colour of the statue)... like the ones he left behind. Doesn't the statue remind anyone of The Lone Ranger? Dale Cooper--the real, pre-Bob Cooper--is a lone ranger type--always does the right thing, and operates on a level by himself in many ways. Or maybe I'm just old. . . .